Are you looking for a relaxing place to fish in the Gulf of Mexico? Give the Pensacola Pier a try in Pensacola, Florida. The water is clear, making it easy to see the fish as they come in. Not as many tourists as with other areas in the Gulf. Fish that are typically caught at this pier in Spring/Summer/Fall are Spanish, King, Pompano, Ling, Ladyfish, Hardtail, Jacks, Cigar Minnows, Bluefish, Bonita, Redfish and Tarpon. Winter/Spring/Fall, you can catch Flounder and Sheepshead. 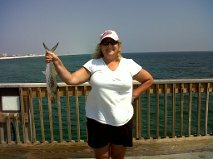 For daily updated fishing reports for all the Northwest Florida Fishing piers, visit www.northwestfloridapierfishing.com. Have a great weekend and FISH ON!